Facebook is getting some long overdue functionality to help you find not just people and pages, but also specific posts from the past. So as in the example above, if you search for your friend Jessica's wedding, it'll search full posts for keywords "Jessica" and "wedding" and hopefully return the result you were looking for. It's hard to believe this is new. 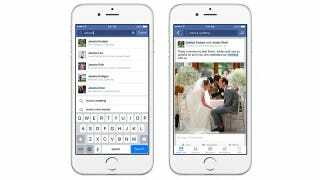 Additionally, Facebook's graph search is coming to mobile. So now, you'll be able to search your friends of friends who work at T.J. Maxx, you'll be able to do it from the food court on your phone, not just from your laptop.